Calendar year totals show strong volumes across all modes of transport of the Port of Virginia. The number of ship calls is dropping, but the vessels are getting bigger at the Port of Virginia. Class I railroads are expanding double-stack service from the Port of Virginia into Harrisburg and Pittsburgh. 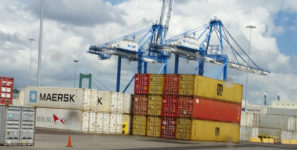 The Port of Virginia experienced the most productive August in its history, moving 240,605 TEU, a 2.2 percent increase when compared with the same month last year. On a calendar-year basis, total TEU volumes are up 7.4 percent; containers, up 7.7 percent; rail, up 4.7 percent; trucks, up 9 percent; and barge, up 26 percent. International Terminals continues, the port team is performing at a very high level with no reduction in service levels and the safety of our colleagues as our first priority,” said John F. Reinhart, CEO and executive director of the Virginia Port Authority (VPA). “Heavy construction on the south-side stack yard at NIT will begin just as the peak season nears its end, so our timing on that project ensures a successful start with minimal disruption to the operation. Reinhart also highlighted growing port-related economic development activity with the opening of Emser Tile’s first East Coast warehouse and distribution center in Suffolk. Emser officials said the facility’s location was chosen in order to take advantage of the port.